The Duquesne University School of Pharmacy residents wanted a hands-on experience for their service project this holiday season. 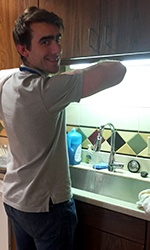 In working with the Ronald McDonald House of Pittsburgh they were able to achieve just that! The Ronald McDonald House of Pittsburgh provides loving and comfortable accommodations for families whose children are recovering at Children's Hospital of Pittsburgh. While this facility is able to help ease the financial burden families face when their children require extensive medical care, they rely on the good will of those in the community to support them financially and physically. 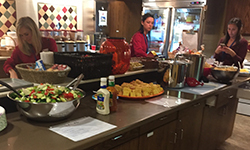 The pharmacy residents used their strength in numbers to provide a home cooked meal for over 60 family members on a cool November evening including chili, salad, cornbread and even dessert. In addition to their culinary efforts, the residents were able to collect several boxes of wish-list items for the facility including toiletries, paper products, and kitchen pantry necessities from their respected sites including the School of Pharmacy, Duquesne University Pharmacy and Primary Care Physicians offices. To say that this was a fulfilling experience is quite the understatement. Not only was it a wonderful feeling to give back to these families who have been through so much suffering, but it was a fun evening of fellowship! The interaction with the children and families was truly priceless and was a great reminder of what the holiday season is all about–giving.